One of the few absolute indications for surgery in patients with a high ankle sprain involving the distal tibiofibular ligament is a third-degree sprain that causes widening or a diastasis of the syndesmosis between the distal fibula and tibia. To restore the ankle mortise, the distal tibiofibular articulation must be brought together with implants, such as screws or synthetic sutures over endobuttons. The usual postoperative course entails initial protection in a splint, wound check and further protection in a cast, and avoidance of weightbearing for 6 weeks, followed by physical therapy and gradual return to normal activities. In 100 patients with isolated lateral ligament sprains, Evans et al found no functional or symptomatic advantage 2 years after injury in patients who were treated surgically as compared with those who were treated with cast immobilization. In fact, the nonsurgically treated group returned to work earlier and had less morbidity than the surgically treated patients. Patients in this study were divided into two groups, each with 30 individuals with anterior ligament sprains only and 20 individuals with anterior and middle ligament ruptures. One group of 50 patients was treated surgically, and the other group was treated with cast immobilization. An isolated complete medial ankle sprain with a palpable defect and demonstrable clinical instability is an indication for surgery, particularly if the deltoid ligament is caught in the medial ankle joint. Surgery allows removal of the ligament from the joint and repair of the ligament. Go to Ankle Sprain for more complete information on this topic. According to a review by Safran et al, more than 20 different delayed surgical procedures are available for chronic ankle instability and sprains. These are classified as either anatomic or nonanatomic. Anatomic repairs use the native tissues, reinforce the existing ligaments, or both. Most of the nonanatomic repair procedures are reconstructive in nature and involve tenodesis between the lateral malleolus and calcaneus, talar head, or the fifth metatarsal. Some of these procedures use the peroneus brevis or longus as autograft and are routed through bone tunnels to provide lateral ankle stability. Use of the local tendons in a nonanatomic manner affects the normal biomechanics of the hindfoot in addition to donor tendon morbidity due to the loss of function from tendon that is sacrificed. If the tissues are of good quality, a direct repair of the ligaments can be performed; if the tissues are of poor quality, autograft or allograft tendons are used. Broström described a repair that reapproximates the ruptured ligaments and restores true normal anatomy of the ankle. 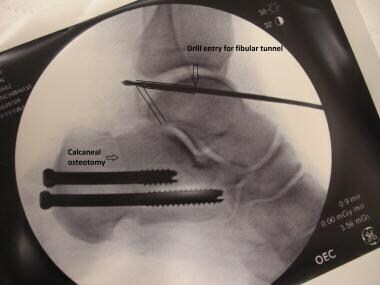 Gould et al described a modified Broström procedure that allowed reinforcement of the repair and limited inversion (reducing the likelihood of injury) and that helped to correct the subtalar component to the instability. This modified procedure permitted restoration of the normal anatomy and preserved normal ankle motion with less surgical exposure. Brostrom-Gould repair. Instrument under anterior talofibular ligament (ATFL). Brostrom-Gould repair. 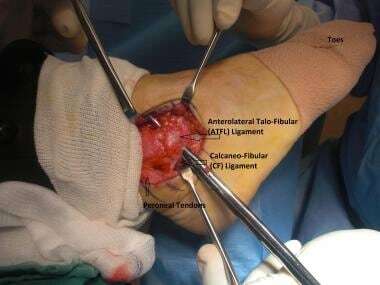 Transected anterior talofibular ligament (ATFL). Brostrom-Gould repair. Avulsed fibular bony fragment. Brostrom-Gould repair. Excision of avulsed fibular bony fragment. Brostrom-Gould repair. 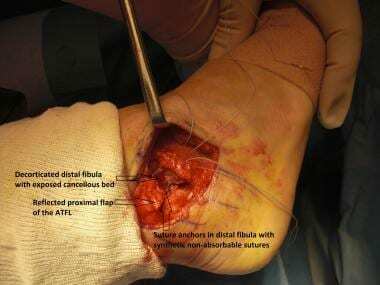 Reflected proximal flap of anterior talofibular ligament (ATFL), cancellous bed at distal end of fibula, and sutures coming out distal flap from embedded suture anchors to help advance distal flap of transected ATFL. Brostrom-Gould repair. 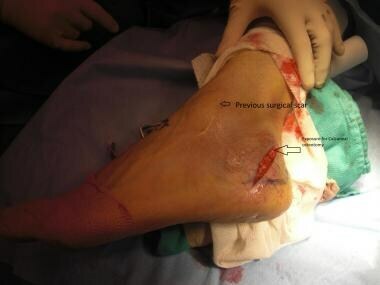 Double-breasted anterior talofibular ligament (ATFL) with proximal flap overlying distal flap. Brostrom-Gould repair. 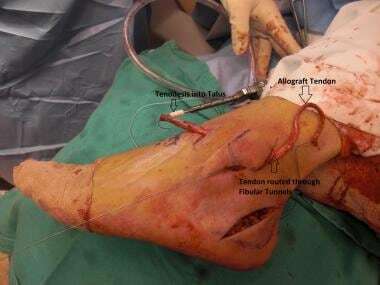 Incorporation of extensor retinaculum in suture for advancement of retinaculum over repaired anterior talofibular ligament (ATFL). Attenuation or failure of previously repaired ligaments in case of recurrent laxity necessitates augmentation with auto- or allograft, in that the local tissue is frequently of insufficient quality. Furthermore, failed surgical repair may be associated with previous surgical scars and compromised local skin and subcutaneous tissues. Minimally invasive allograft reconstruction of lateral ankle ligament. View post calcaneal osteotomy showing patient positioning and scar from previous failed lateral ankle ligament repair. Minimally invasive allograft reconstruction of lateral ankle ligament. Percutaneous exposure for graft insertion using biotenodesis screw into talus and allograft routed distally. Minimally invasive allograft reconstruction of lateral ankle ligament. Talar tunnel. Minimally invasive allograft reconstruction of lateral ankle ligament. Fibular tunnel. Minimally invasive allograft reconstruction of lateral ankle ligament. Postoperative scars from percutaneous routing of allograft tendon. For each of these procedures, the overall technical approach is essentially the same. A longitudinal incision is made running just posterior to the prominence of the lateral malleolus. The incision is then extended to allow harvesting of the peroneus brevis tendon. Before harvesting the tendon, the joint is inspected and debrided if necessary. Occasionally, the ATFL, the CFL, or both are avulsed from the fibula with a piece of bone. This so-called os subfibulare should be excised. 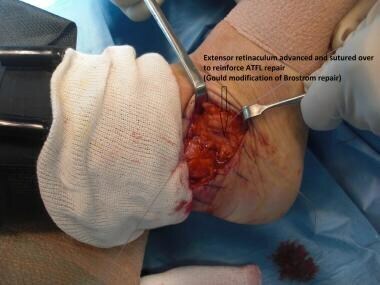 The integrity of the superior peroneal retinaculum should be maintained during exposure of the peroneus brevis tendon. The anterior one third of the tendon is isolated distally and split from the distal position to the musculoskeletal junction. This tendon portion is transected at its proximal aspect. A drill hole is made through the distal fibula, and the split portion of the peroneus brevis is passed through this hole. The tendon is tensioned with the foot in mild plantarflexion and eversion. Because the peroneus brevis tendon is anchored to the fibula, the Evans reconstruction indirectly limits inversion of the ankle and anterior talar translation while also limiting motion of the subtalar joint. This procedure provides stability in a location that lies between the ATFL and CFL; therefore, it does not restore the anatomy or biomechanics of the hindfoot. The Watson-Jones procedure reconstructs the ATFL but not the CFL. This technique makes use of the Evans tenodesis. One important addition, however, is that the peroneus brevis graft is routed anteriorly through the talar neck to reconstruct the ATFL. 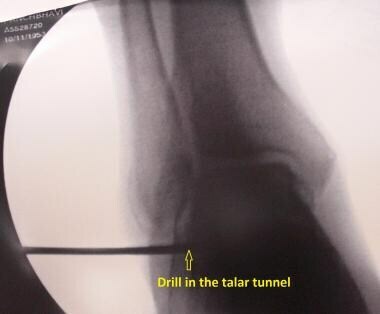 The Chrisman-Snook procedure, most commonly used for subtalar instability, involves using half of the longitudinally divided peroneus brevis tendon to substitute for or reconstruct the CFL. In this procedure, the peroneus brevis graft is brought through the fibula from anterior to posterior to reconstruct the ATFL. It is then brought posteriorly and inferiorly to the calcaneus in a weave pattern to reconstruct the CFL. This procedure, though technically demanding, has been repeatedly demonstrated to produce satisfactory stability in patients with talotibial and combined talotibial and talocalcaneal instability. Most of the nonanatomic procedures are now considered to be of historical interest only, having been superseded by anatomic repairs that use either native ligaments or allograft tendons. In the literature, the Watson-Jones procedure was associated with subjective instability 20-90% of the time; the Evans procedure, 20-33%. In addition, with the Evans procedure, a persistent anterior drawer sign was found in 45-60% of patients. In the Chrisman-Snook procedure, 13-30% of patients had subjective persistent instability. Decreased inversion is common with all these procedures. In each procedure, a specific weave pattern (referring to the manner in which the peroneus brevis tendon is routed through the drill holes) is used. Matheny et al compared outcomes and revision rates after Broström-Gould lateral ankle ligament repair with those after anatomic allograft reconstruction in 86 patients with lateral ankle instability. At an average follow-up of 3.0 years, no patient in either cohort underwent revision lateral ligament surgery. The authors concluded that anatomic allograft reconstruction, as compared with lateral ankle repair, produced similarly favorable outcomes, including high patient satisfaction, high function and activity levels, and no need for surgical revision. Petersen W, Rembitzki IV, Koppenburg AG, Ellermann A, Liebau C, Brüggemann GP, et al. Treatment of acute ankle ligament injuries: a systematic review. Arch Orthop Trauma Surg. 2013 Aug. 133(8):1129-41. [Medline]. Evans GA, Hardcastle P, Frenyo AD. Acute rupture of the lateral ligament of the ankle. To suture or not to suture?. J Bone Joint Surg Br. 1984 Mar. 66(2):209-12. [Medline]. Safran MR, Zachazewski JE, Benedetti RS, Bartolozzi AR 3rd, Mandelbaum R. Lateral ankle sprains: a comprehensive review part 2: treatment and rehabilitation with an emphasis on the athlete. Med Sci Sports Exerc. 1999 Jul. 31(7 Suppl):S438-47. [Medline]. Valkering KP, Vergroesen DA, Nolte PA. Isolated syndesmosis ankle injury. Orthopedics. 2012 Dec. 35(12):e1705-10. [Medline]. Gould N, Seligson D, Gassman J. Early and late repair of lateral ligament of the ankle. Foot Ankle. 1980 Sep. 1(2):84-9. [Medline]. Corte-Real NM, Moreira RM. Arthroscopic repair of chronic lateral ankle instability. Foot Ankle Int. 2009 Mar. 30(3):213-7. [Medline]. Li X, Killie H, Guerrero P, Busconi BD. Anatomical reconstruction for chronic lateral ankle instability in the high-demand athlete: functional outcomes after the modified Broström repair using suture anchors. Am J Sports Med. 2009 Mar. 37(3):488-94. [Medline]. Panchbhavi VK. Minimally invasive allograft lateral ankle ligament reconstruction. Techn Foot Ankle Surg. 2011 Sept. 10 (3):117-21. Cottom JM, Rigby RB. The "all inside" arthroscopic Broström procedure: a prospective study of 40 consecutive patients. J Foot Ankle Surg. 2013 Sep-Oct. 52 (5):568-74. [Medline]. Larsen E. Tendon transfer for lateral ankle and subtalar joint instability. Acta Orthop Scand. 1988 Apr. 59(2):168-72. [Medline]. Kim JS, Young KW, Cho HK, Lim SM, Park YU, Lee KT. Concomitant Syndesmotic Instability and Medial Ankle Instability Are Risk Factors for Unsatisfactory Outcomes in Patients With Chronic Ankle Instability. Arthroscopy. 2015 Aug. 31 (8):1548-56. [Medline]. Park CH, Lee WC. 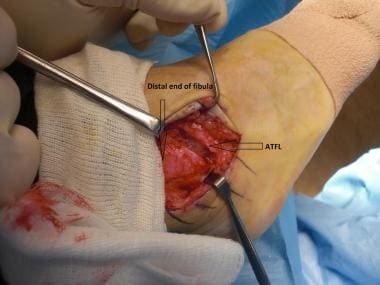 Donor Site Morbidity After Lateral Ankle Ligament Reconstruction Using the Anterior Half of the Peroneus Longus Tendon Autograft. Am J Sports Med. 2017 Mar. 45 (4):922-928. [Medline]. Matheny LM, Johnson NS, Liechti DJ, Clanton TO. Activity Level and Function After Lateral Ankle Ligament Repair Versus Reconstruction. Am J Sports Med. 2016 May. 44 (5):1301-8. [Medline].